In Indian mythology and beliefs the Sun God is also known as Suya or Aditya. 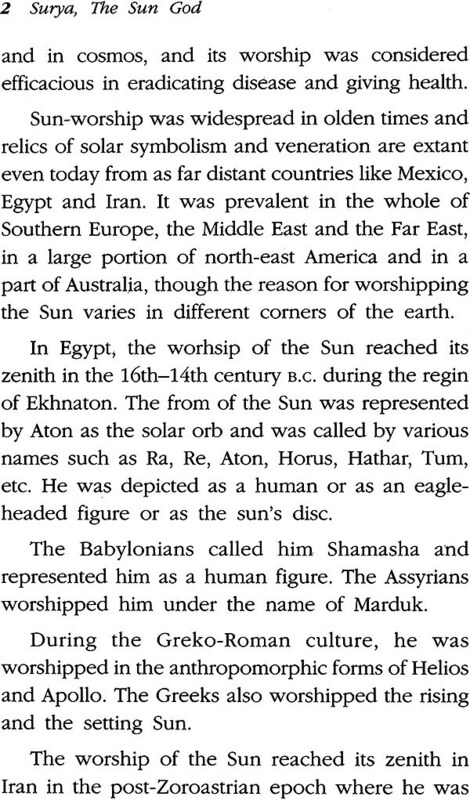 From time immemorial the sun god is worshipped and revered as endless source of energy. The puranas, the Vedas and the ancient Hindu epic, the Ramayana contain numerous references to the worship of Surya, the Sun God. In the vedic scriptures, Surya has been described as a store house of energy and radiance without which nothing can survive on earth. There are numerous temples for the Surya spread across the length and breadth of this great country, some even dating back to 400 BC. In India, Surya the Sun God has been venerated and worshipped for many centuries. 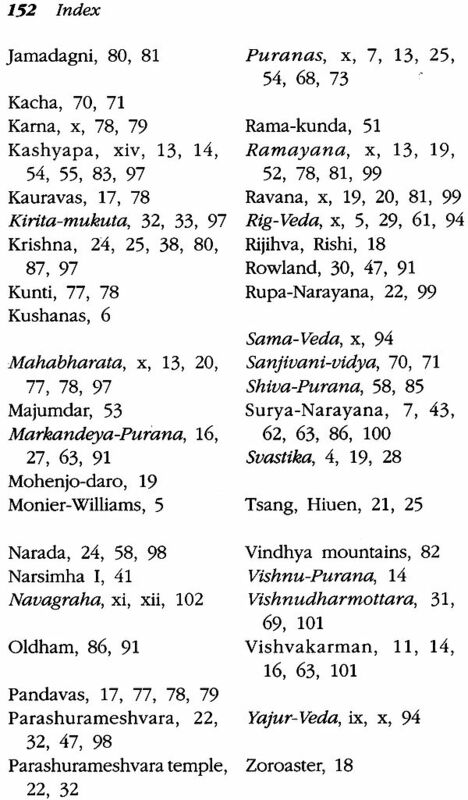 From Kashmir to Kanyakumari every devout Hindu bows in obeisance by offering prayers to the rising Sun or Surya and thanks Surya for the bounties bestowed on humanity. Not a flower can bloom, not a soul can stir, nor the river flow but for the magnanimity of the mighty Surya. Surya in His wrath parches once fertile fields, saps dry men and material into nothingness, and spreads by His absence a complete darkness within and without. Such are the blessings and curses of the great Surya. 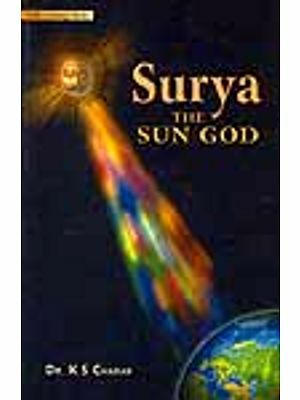 This book is about Surya, the legends and myths surrounding it and about the worship of surya without whose power and energy life is impossible in this universe. It is hoped that the readers will be enlightened as the author was while writing it. A Botanist by profession with a PhD in Botany from Delhi University, Dr. Shakti M. Gupta is an established author. She got her second PhD from Faculty of Oriental Archaeology, Martin Luther University, Wittenberg Halle, Germany, for her thesis on Plant Myths and Traditions in India. She is also an ethno-botanist and her book Plants in Indian Temple Art is based on a survey of plants sculptured on Hindu, Buddhist and Jain temples including myths legends and folklore associated with these plants. In the year 2000, the Association of Plant Taxonomy, awarded her the Jnan Chandra Memorial Medal for this book. 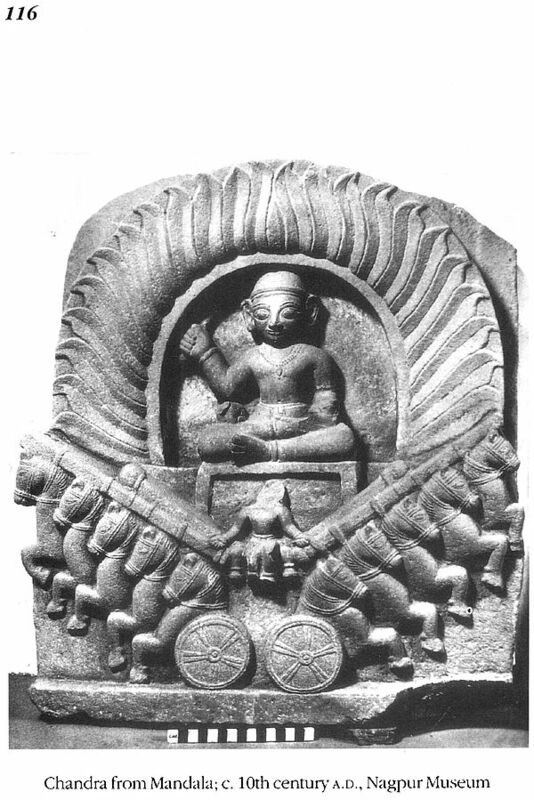 Surya, the Vedic God of light, is gloriously pictured as riding a golden chariot that traverses the sky with a watchful eye observing the Good and bad deeds of both mortals and immortals. 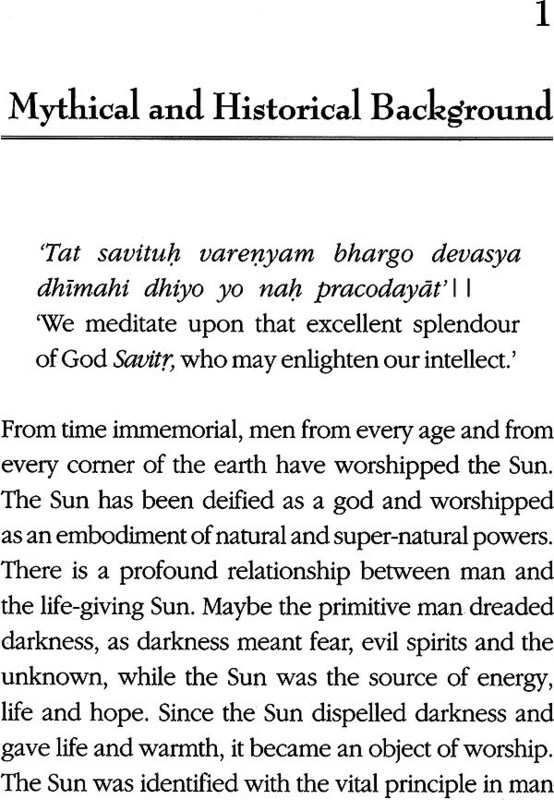 The worship of Surya was considered so important that the Bharadvaja incident narrated in the Yajur-Veda is just to show how difficult it is to master all the Vedas, also like the three mountains in their magnitude, study of even one of which is impossible in a life-time, which therefore, leaves no option but to concentrate on the essence of the Veda, the cult of Surya. Vide the line ‘ye arvan uta va purane vedam vidvan samabhito vadantyadityam eva te parivadanti sarve’ (‘Young and old, all those who know the Veda sing only all about the glory of Aditya’). 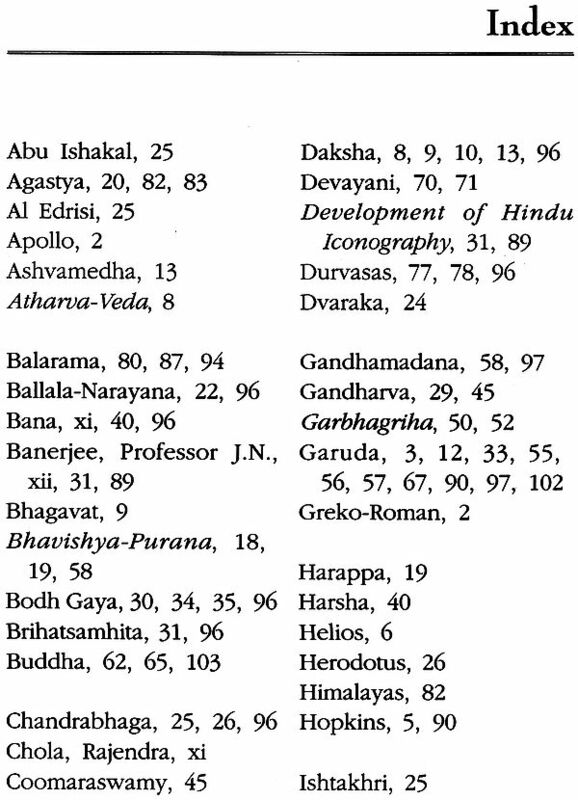 The twelve Adityas in various important aspects of the deity make the study of Surya an important cult complex. 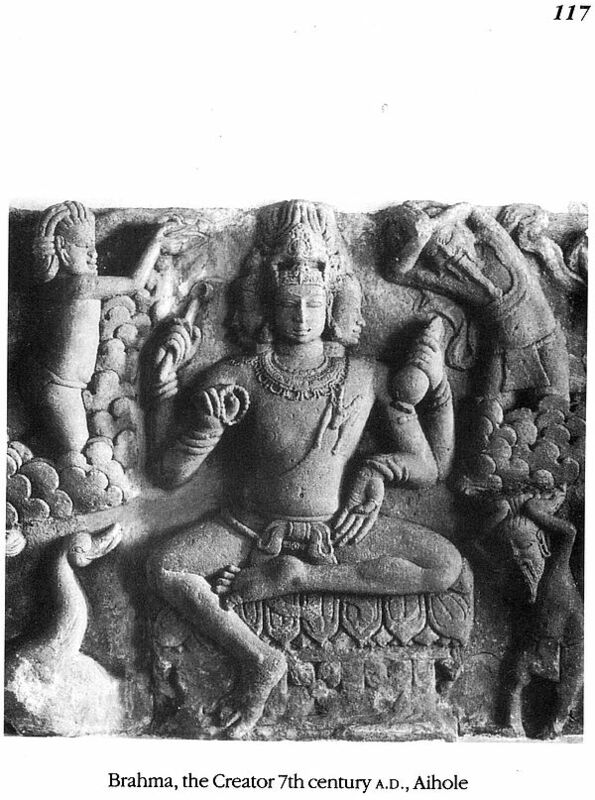 The bringing together of Surya, Vishnu. Brahma and Shiva identifies him with the concept of the Trinity itself. 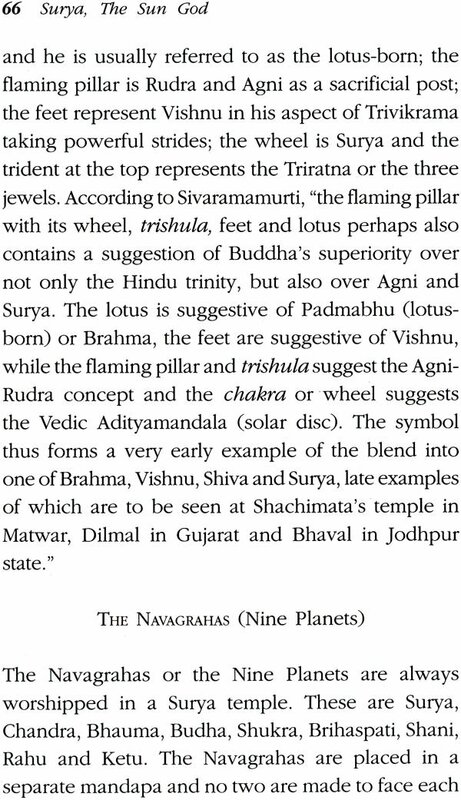 The description of the three Vedas as Surya, the solar orb signifying the hymns of the Rig-Veda, the flame in the orb, the musical lines of the Sama-Veda, and the personified deity in the blazing flame as the hymns of the Yajur-Veda illustrate the three Vedas as shedding solar light. Adityo va esa etanmandalam tapati tatra ta rcas tadrca mandalam sa rcam loko’-tha va esa etasmin mandale’rcir dipyate tani samani sa samnam loko’-tha va esa etasmin mandale ‘rcisi purusas tani yajumsi sa yajusa mandalam sa yajusam lokah saisa traiyyeva vidya tapati ya eso’n-taraditye hiranmayah purusah. 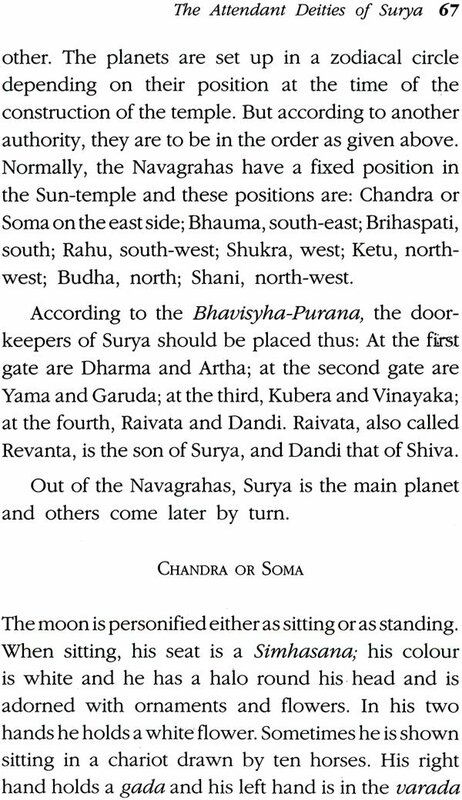 The Puranas have contributed in no small measure to elucidate the importance of Surya as a deity. Adityahridaya in the Ramayana is one of the greatest hymns assuring success. It is after repeating this prayer to Surya as taught by Agastya that Rama, who was exhausted, felt refreshed, attacked Ravana attacked Ravana again, and easily overcame him. The family in which the Lord himself was born as Rama originated from Surya, as Vaivasvata Manu was the offspring of Vivasvat. In the Mahabharata the most glorious hero Karna, than whom there was no greater donor and who could give away even his most precious Kavacha and Kundalas, was born of Surya. 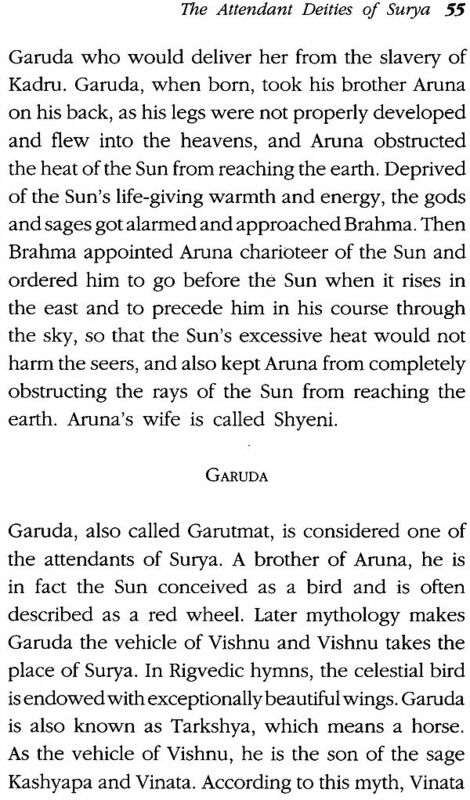 There are interesting stories, as in the Mahabharata, that show how Surya himself taught the antidote to his fierce rays, the umbrella to cover the head and sandals to protect the feet. Bana has a magnificent description of how Prabhakaravardhana, the great king who adored the Sun-God, offered him daily worship. Even in describing Prabhakaravardhana the Banskera plate compares him to the Sun for removing all the distress of his subjects whom he treated as his own offspring. The single wheel of Surya’s chariot is only to emphasise the most difficult straight path of justice that Surya maintains. His chariot and wheel only symbolize difficult asidharavrata. 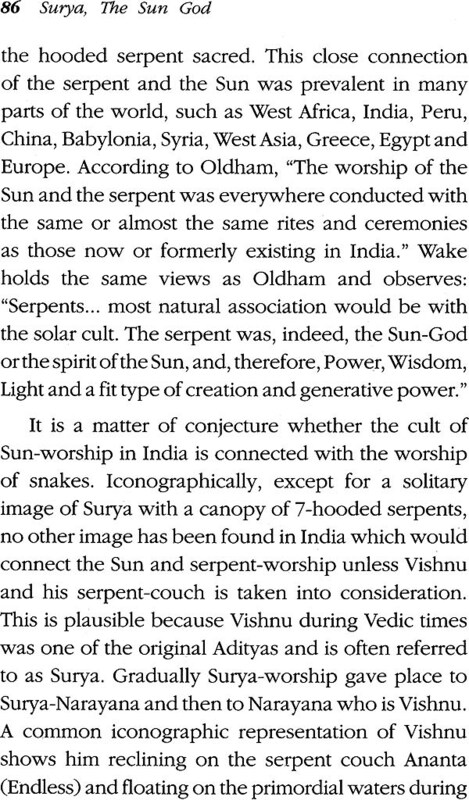 In ancient India the worship of the Sun was a great cult in itself. It was Shankara who brought together different warring cults and created a synthesis in the Panchayatana. Famous temples were built for Aditya at Martanda in Kashmir in the North, at Konark in Orissa in the East, in Suryanagarkoil in Tanjavur district in the South and Modhera in the West. A famous temples of the Sun glorified in a Gupta inscription was constructed by silk weavers in Dashapura in Gujarat in the time of Skandagupta. The fragments of a pillar with the Surya-shataka inscribed in Grantha characters of the early Chola period from Kanchipuram now preserved in the Madras Museum reveal the fact that there existed a complete mandapa for Surya giving the entire text of the Suryashataka by Mayura. The wonderful Navagraha carving created by Rajendra Chola in Gangaikondacholapuram, with Surya depicted as a large lotus on a chariot drawn by seven horses, with the rest of the planets facing the eight direction, is a glorification of the Navagraha concept as in the north, that Rajendra appreciated both as a connoisseur and as a devotee. 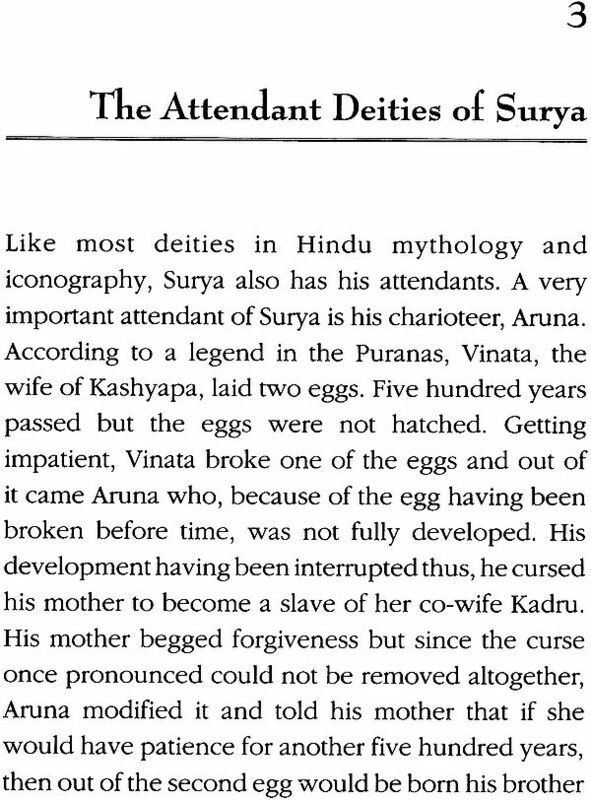 Such a fascinating subject as Surya has not received adequate treatment at the hands of scholars except for a magnificent long paper by Professor J.N. Banerjee. Illustrations given there were restricted to suit the requirements of the journal in which it was published. A monograph on Surya with adequate illustrations was awaited for quite a long time. 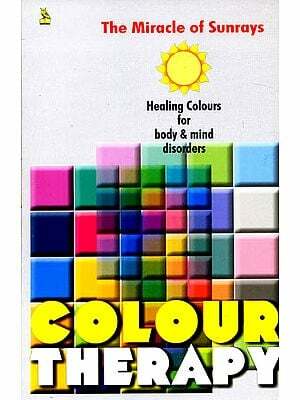 Dr. (Mrs.) Shakti M. Gupta has done a great service by taking up this theme and studying it elaborately from every point of view. She has traced the origin of the concept from Vedic times, discussed the antiquity of Sun-worship from historical records and inscriptions, the truth of the belief that Surya bestows health…arogyam bhaskarad icchhet, the iconographic forms of Surya, the famous temples associated with the Sun-God, the various other deities associated with him, as well as his consorts and attendants, his place among the planets, his importance in composite figures, and so forth, making it a very valuable contribution to the solar symbol and its deity in India. I am sure the book will be welcomed by all scholars and receive the attention that it deserves.